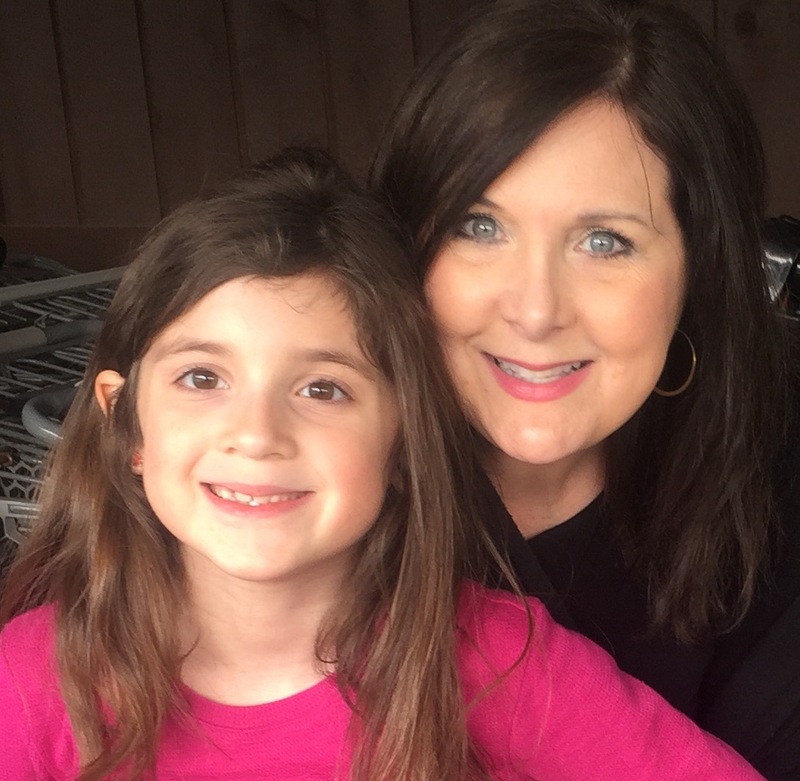 Today we’d like to introduce you to Cindy Kienzle. Thanks for sharing your story with us Cindy. So, let’s start at the beginning and we can move on from there. 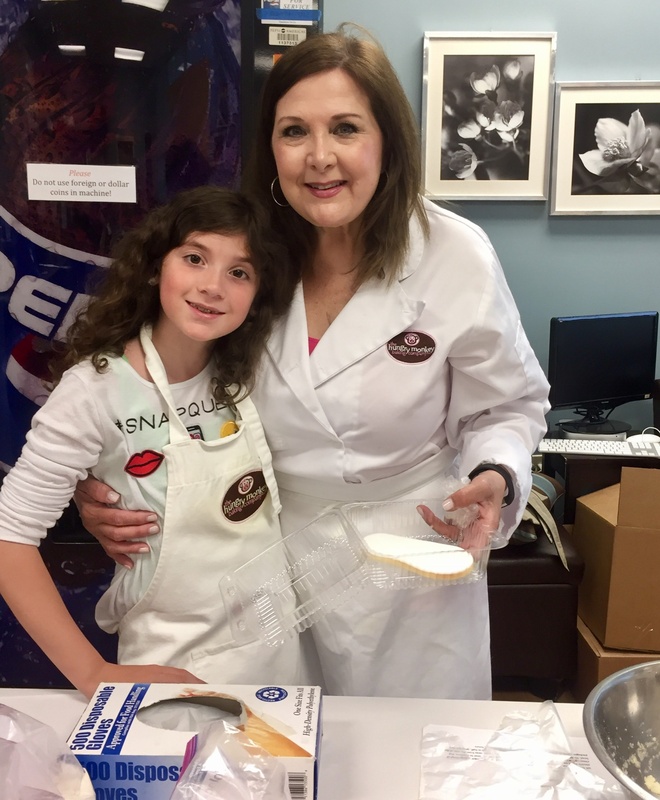 Everything good for me started later in life—I married my husband Tom at 47, gave birth to my daughter, Lily, four days before I turned 49, and started Hungry Monkey Baking just days before my 51st birthday and on my daughter’s second birthday! It was 25 years in the making, as friends, colleagues, and family always told me to sell my signature chocolate chip banana bread that I created. But with a secure marketing career, I was hesitant to risk it all for my dream to bake. Fast forward to 2010 when I found myself raising my daughter, who I was discovering had some special needs, and jobless. I wanted to get back to work, but I needed flexibility. Fate intervened, and my friend Stella asked if I would bake and sell my chocolate chip banana bread for a local charity for kids with learning disabilities. I said yes, and my banana breads sold out two days in a row. Moms continued to call long after the event ended…. they’d stop by my home to buy a loaf or two. I thought “well, now’s my chance to see if I can turn this into something. Is there truly enough demand?” So I started out in two farmers markets and sold out weekly. Three months later I was featured in a local magazine, and a James Beard Award Winning reporter did a story on me. Those two things were enough to get the attention of a north shore grocery chain, Sunset Foods. I credit them with truly supporting local. They’re the folks that launched Skinny Pop, too! It’s been seven years, many ups, some downs. But I’ve learned it’s never too late to follow your dream. It’s certainly not been a smooth road; there have been many bumps along the way and one or two off-road adventures! One thing I learned is “you don’t know what you don’t know.” I had been in marketing communications and advertising and has built several successful ($500 million) programs for a large organization. But baking and growing a baking business and scaling it up were things I didn’t know. And while my past experience in PR, design, and marketing were helpful building a brand, it was not in scaling Hungry Monkey up to a recognizable brand. 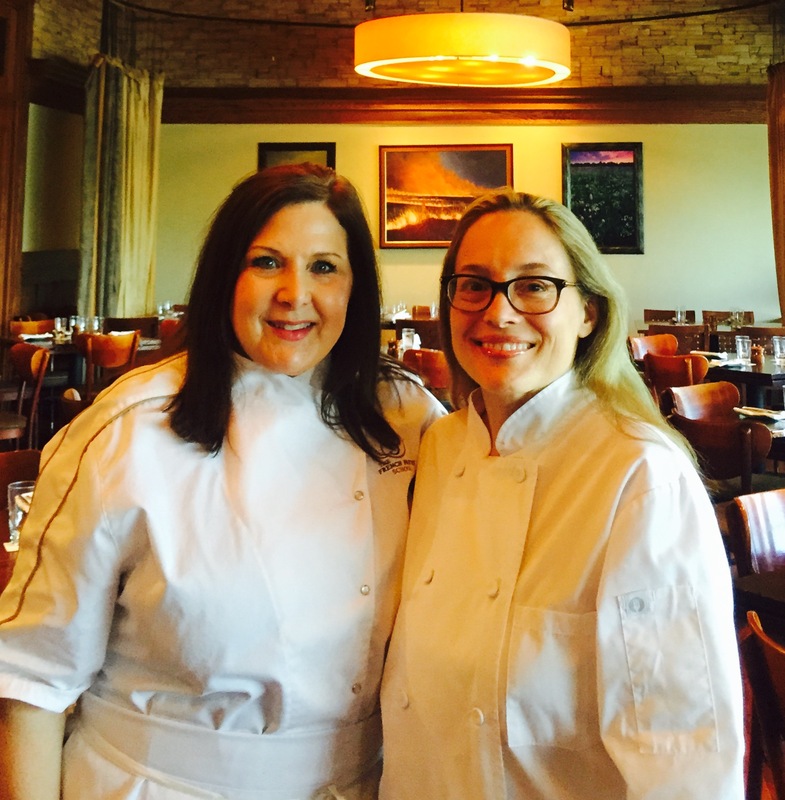 We’re very well known along the north shore, particularly in Lake Forest, Highland Park, Northbrook, long Gove and Libertyville, but expanding beyond has not gone as smoothly as hoped. I found myself baking, wrapping, packing, and jockeying for position with Dairy & Beer trucks delivering my products. Finding a distributor, Norman Distribution, someone who knows grocery delivery & merchandising, has been one of the most impactful things we’ve done. It’s important not to think you can do it all. I could not. Alright – so let’s talk business. 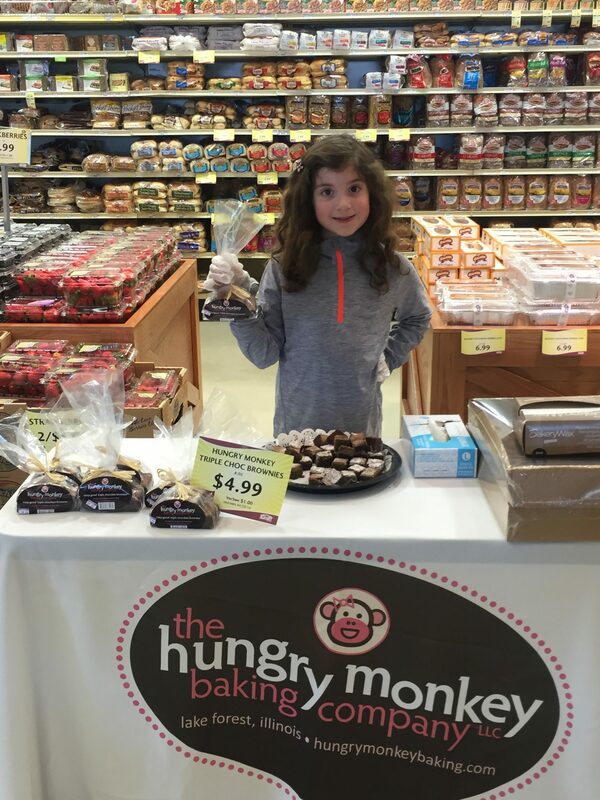 Tell us about The Hungry Monkey Baking Company – what should we know? We are known for our super moist, very fresh and natural “crazy-good” treats. 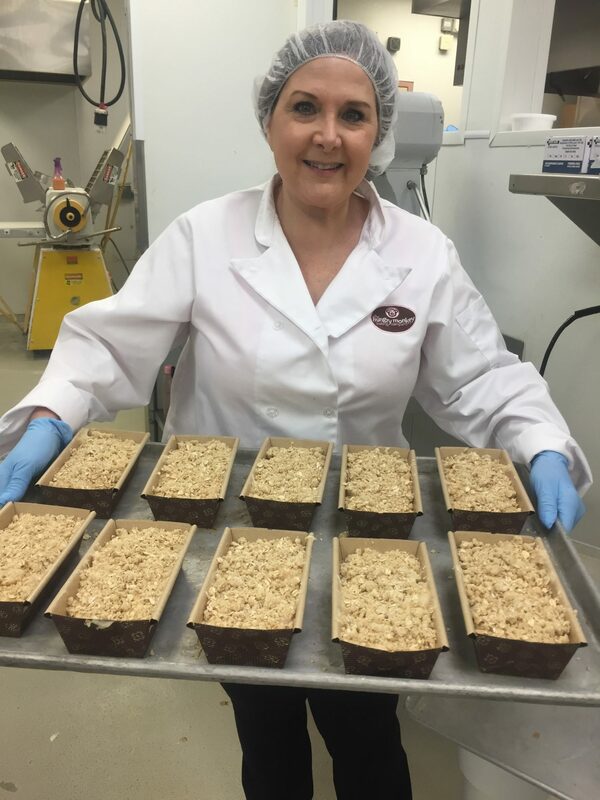 Our signature Hungry Monkey Chocolate Chip Banana Bread is our top seller, mostly because we still make it in small batches and we don’t skimp. We use real bananas, and only bake when the bananas are perfect to bake. Most people think it’s best to use black bananas for making banana bread, but by that time they have broken down and the taste will be off. We’re proud of using the best ingredients, and we try to source locally wherever possible. We’re known mostly for our banana breads-our Original (plain) and Chocolate Chip. But we’re also known for our Triple Chocolate Brownies, which come three to a bag and are dense, rich, smooth. We use the finest cocoa, Belgium dark chocolate, and semi-sweet chocolate. 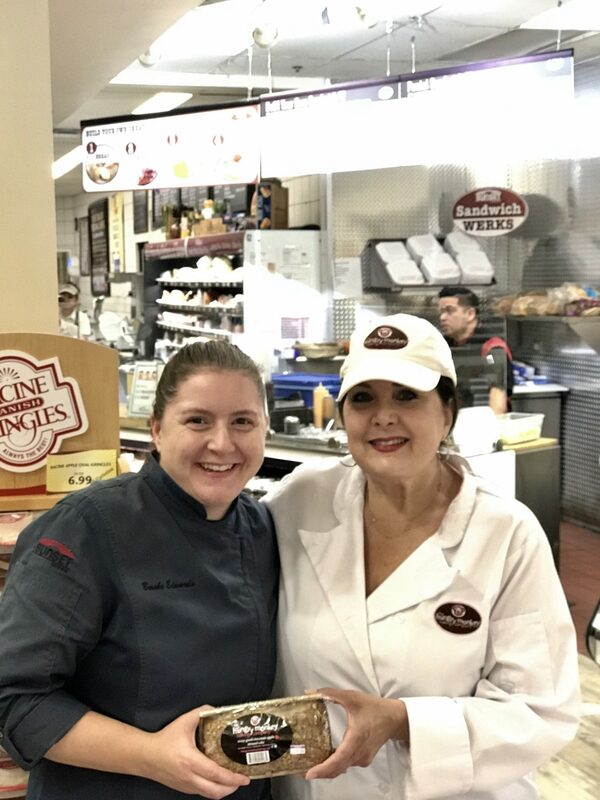 We love to personally engage with our customers at in-store sampling’s as well as on our Facebook page. I think personally engaging and responding to customers’ needs is critical. For example, We changed the size of our breads to 14 oz. each because women told us they only wanted a small splurge. This is a great question! So many others deserve credit! The first person is thank is my husband, Tom, who was supportive from the start, coming home from his real job, then going back to our kitchen to wrap the cool cakes, often until 2 am. 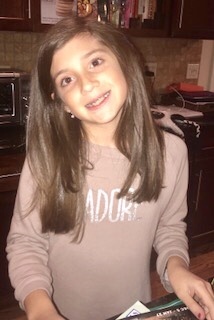 And to my daughter, Lily, who is hungry monkey’s namesake. She inspires me daily. Despite her own challenges, she never gives up, always persevering and delighting us. Another key person was my neighbor, friend, and intern, Lauren, who was with me from the start. She was only in high school at the time, but what an impact she made on Hungry Monkey — from helping me wrap cakes late into the night to sell at the farmers market to setting up our booth at 5 am with me to securing one of the most important PR stories for Hungry Monkey to date, a two page spread in our local magazine, which along with a TV segment around the same time, helped catapult us to the next level-selling in grocery stores. I would be very remiss without mentioning all my friends & family who came out with me weekly to help me at the farmers markets and in my kitchen in those early days- Eileen, Sheryl, Beth, Anne, Heather, Carolyn, Tommy, Laurie, Genevieve, Rhyan, Nikki and so many more who would come to visit me at our booth! Even customers, like Larry, helped me make my very first store delivery! I want to also mention all the kids who would come running up to our booth, “Hungry Monkey, Hungry Monkey” they’d scream…they were our first customers and influencers—they got their parents to buy! And I can’t forget my very first customer, Lynne, and those who would come weekly, like Judy, without fail, buying for her grandkids. 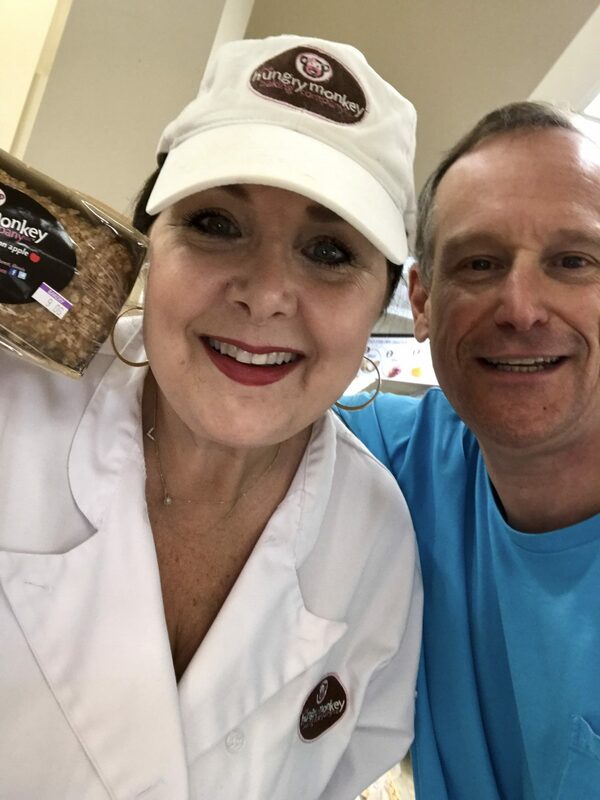 Sunset Foods, including their Bakery Director, Brooke Edwards, and President, John Cortesi, have also been incredibly supportive of Hungry Monkey over the past 7 1/2 Years. They truly embrace mom-owned, women-owned & local entrepreneurs. 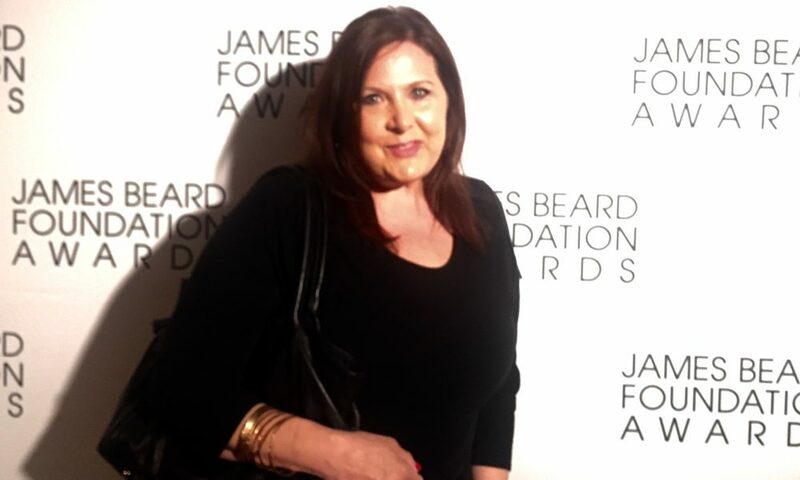 For the past 30 years, I’ve been inspired by James Beard Award-Winning Chef Sarah Stegner-she is a dear friend and is so supportive of me and Hungry Monkey. 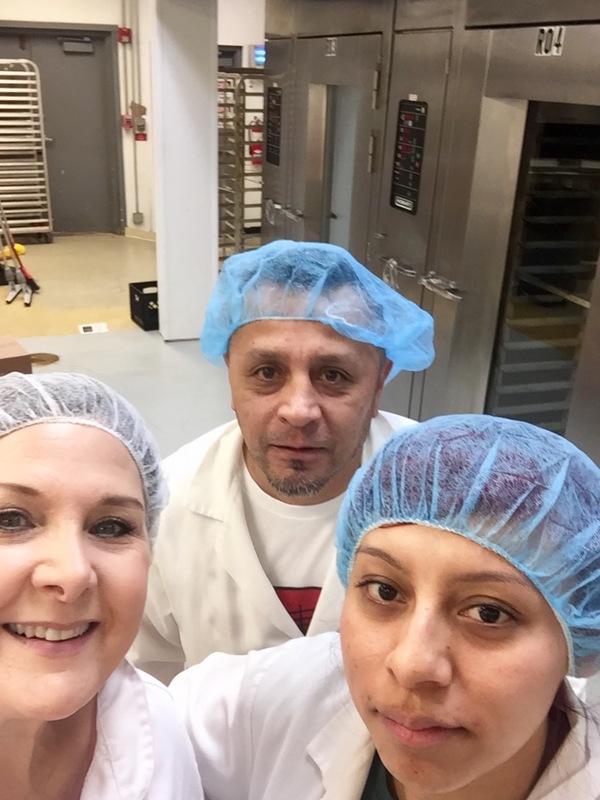 Lastly, I’m incredibly grateful for our baking partners, Brett Anthony Foods, and our bakers, Head Pastry Chef Ulises and his team, VV & Romero. We could never have experienced growth without them. Cindy, her baked goods, and her company are amazing, genuine and delicious! Love Hungry Monkey! My husband and I were given an assortment of Hungry Monkey breads as a gift. We couldn’t decide which one was the best. They were ALL so good . Love the breads , the packaging was very classy and if you’re looking for a unique gift, this is company does the trick!